The business of car hauling is great if you have a passion for cars and want to travel and get paid for it. It is the kind of business that knows no bounds. You could do it within the confines of your local neighborhood or expand it to the state or even the entire country if you want. First, take a trip to city hall to apply for your business license, which you will need to be able to operate your business. You can do this at the business division at city hall. It doesn’t matter if you plan to do your business in a different state, or states; you will still need to be licensed in your local area where you will have your headquarters, which could even be your home. The requirements for that business license are different, depending on the specific state and city you reside in. You can find all the information you need at city hall. The next step is to figure out just how many cars you’re willing to haul simultaneously. We can call this your hauling capacity. If you’ll be operating in your local area alone, then one car at a time is good enough. However, if you’re planning to operate across states or the entire country, then your hauling capacity should be up to six cars if you’re going to be profitable. Once you’ve figured out a hauling capacity, you can now purchase your two greatest assets: the car trailer and the truck. These should be equipped to haul the maximum number of cars that you intend to haul. The trailer should be able to load six cars. Three will go to the top and three to the bottom. You’ll also need your truck to be heavy duty in order to be able to handle the heavy load. A Ford 350 or a Chevrolet 3500 are both good for the job. Both are diesel trucks, which is the preferred engine for towing since it offers far more power on a daily basis than an engine that runs on gasoline. Your truck can either be new or secondhand, but should be in great shape. You can write the purchase off as a business expense for tax purposes. The next step is to get insurance for your vehicle and trailer. The insurance should also cover the cars that you’ll be transporting. You’ll have to speak to an insurance agent to find out what policies are available to you. Once you’ve taken out the insurance, you will be provided with documentation that you should have in your truck always. You should head on over to the Department of Motor Vehicles to find out what type of license you need for your truck and trailer. There are some states with laws that require you to have a commercial driver’s license when dealing with large trailers. Your first partnerships should be with local car dealerships, especially those ones that deal in used vehicles. Most people will buy their cars online, which means the cars have to be hauled to them. 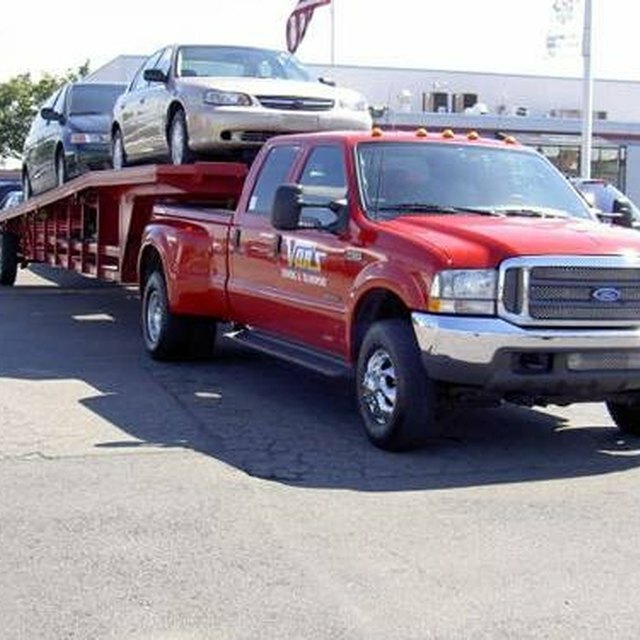 As a car transport business, you can make deals with dealerships to haul their vehicles to their location. If this works, you will not only get good references, but you will also get repeat business. Advertise your business aggressively on the internet by buying ads on sites like eBay and AutoTrader. Hundreds of cars are sold on these sites every day and they have to be hauled to their buyers. Advertising is a great way to gain more hauling jobs. Ebay Motors sells cars daily. AutoTrader is a popular car auction site. Olivia is a business writer with nearly two decades of hands-on and publishing experience. She's been published in several business publications, including The Employment Times and Business Idea Factory. She also studied business in college.